Welcome springtime! Mother Nature's awakening anew and coming into buds. So are our faces. Unfortunately. The good news is there are natural DIY solutions all more effective and less harmful than the standard costly range offered by pharmacists, dermatologists and other cosmetic money-grubbers on Big Pharma's payroll that can only make things worse. This is mainly for women, though not only. In addition to a healthy lifestyle and diet, you are advised to drink a lot (of water) and avoid using skin irritating antibacterial products, soaps, etc. which destroy its protective hydrolypidic layer. You may use natural ACV cleanser (1/3 apple cider vinegar in 2/3 mineral water) or oil washing solution. Internally, you may take a one-month treatment of magnesium choloride (one glass daily) which works fine in reducing spot outbreaks. Locally, try applying thyme or manuka honey before bedtime. Its antibacterial, anti-inflammatory and healing properties will safely dry out your pimples not the skin around. For whiteheads, you may apply some thick paste made with baking soda and water and leave it to dry for quick and effective results. In addition to the tips above, it's essential to remove dead skin cells and pollution particles from your face to allow your pores to breath and prevent pimples and blackheads. The gel scrub recipe below is very easy to make and provides gentle facial exfoliation suitable for sensitive skin. Apply once a week on clean face while still wet and massage in small circular movements avoiding the eye contour area. Rinse with clear water. You may apply a clay mask or else afterwards. In a sanitised bowl, mix aloe gel and fragrance if you use any (I've used oily rose petal fragrance, it smells like heaven) then add the powder. Transfer to a small jar. Since the gel already contains a preservative, the mixture should keep at least 6 monts (during summertime, it's safer to store it in the fridge). This corrector provides extra coverage and is mainly used at night to dry out pimples without causing any skin desquamation, but may also be used with concealer and mineral or non-comedogenic light foundation (see Related articles) to hide pimples and red spots during the day. Melt wax, butter and coconut oil in double boiler. Meanwhile, crush oxides with a mortar. Add black cumin and tea tree oils to the melt mixture then crushed powder and mix well avoiding clumps. Pour into a stick (recycled or bought online — you may find some on Amazon). Put cap on and chill about 30-60 minutes until hardened. This is a traditional dark circle concealer for the eye contour zone, but it is also suitable for use on red spots as it will both conceal and treat them. Crush oxide and ochres with a mortar. Melt shea butter in a double boiler. Add oils and vitamin then crushed powder. Mix well avoiding clumps. 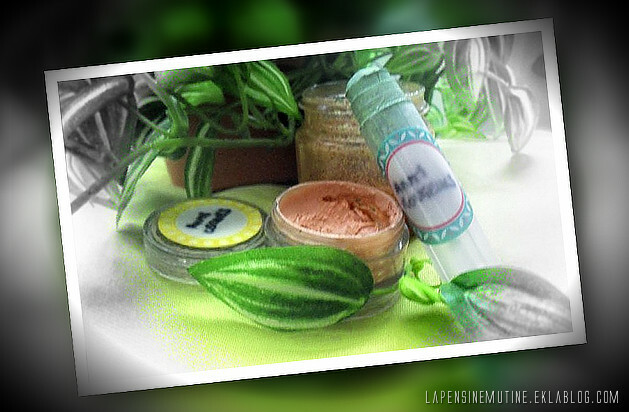 Transfer to a clean small cosmetic jar and leave to cool overnight before using. That's it. You are now ready to fight and all-out war against ugly pimples that should have known better than to pop up on your face.